Nathan P. Gilmour , 25 October 2010. 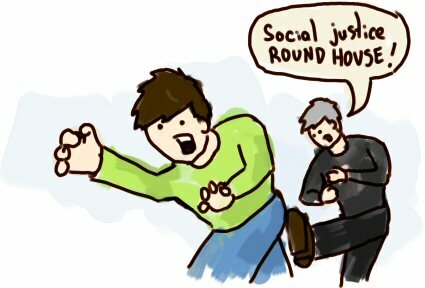 I have to admit that I always feel like I’m the unwelcome advocate when the phrase “social justice” comes up in Christian circles. No matter who I’m talking to, I know that my position is going to end up odious. For those whose piety runs towards equating Christian commitment and activism in behalf of social justice, I can’t help but appear a fatalist of sorts (though I prefer to think of it as providence rather than fate). I do grant that some manners of governing are worse than others, and I certainly think it’s the educated Christian’s duty to be educated and to speak the truth regarding the state, but I’ve also got a deep suspicion that aligning one’s self, much less one’s God, against this or that political faction runs too much a danger of idolatry, especially when being against one faction, in America’s Manichean political arena, means allying with the other. I prefer to be a Platonist of sorts, never ceasing to note where this or that candidate’s platform is actually promising bad things and of course never forgetting that a campaign promise is only as good as the diluted delivery later. On the other hand, because I do think that some governments are worse than others, and that staying informed on the actual substance of governance (rather than birth certificates, tasteless remarks on television interviews, and malapropisms) is worth a Christian’s time and effort to understand, and that republics are ultimately better for my neighbors than are tyrannies, I know that I must appear entirely too “political” to others. (Of course, Aristotle would never have understood how “political” can be an indictment, since the human being is an animal who lives as part of a polis, but I don’t expect too many people to be familiar with Aristotle.) What these folks often ask is whether I’m saved by justice or by mercy, the implication, as I take it, being that I’m somehow in favor of one thing for myself but something entirely different, and perhaps even contradictory, for the other person. I’ll admit that I’ve never been quick enough on my feet to ask the next, properly Socratic question, so I suppose this little essay is my attempt to do so. The justice-or-mercy question, in my estimation (and I’m always glad to entertain that I’m wrong in my estimations–the comment bar is just below), assumes some things about reality that, in my estimation, are bad assumptions. Two categories that theologians use when they talk about being (or Being, if you’re German) are univocal and analogous. (Some also talk about polyvocal being, but I’ve not been able to make sense of that.) Those who are of the camp of Thomas Aquinas (like myself) tend to say that the sentences “God exists” and “God is good” and “God is love” are statements that assume analogy, in other words that God’s being is related somehow to what we mortals think of as existence, but the facts of God’s immortality and God’s omnipotence mean that the things that define (to be woodenly etymological for a second, those things that “put limits on”) our existence don’t define God’s. And our threescore-plus-ten lives mean that what we think of as love (of the eros or of the agape varieties, really) are related to but don’t stand identical with God’s love. And so on. The camp that claims that being is univocal (among them Duns Scotus, William of Ockham, and most popular atheist writerss of the twenty-first century) say that the sentences “God exists” and “Gilmour exists” are only different in their subjects, not their predicates. Most (perhaps not Richard Dawkins) would then say that further true sentences about God would not be true sentences about Gilmour, but for the univocalist, predicates of existence and such are of the same type irrespective of their subjects. I have to admit that there’s some elegance in the formulation, but I do think that it relies on an assumption that the king is as different from a peasant as God is from the king, and that’s where I think univocal metaphysics miss the boat. I’m not going to deny that penal substitutionary atonement is a valid theory of atonement (although I neither think of it as uniquely valid nor as the most adequate to Biblical revelation, but that’s for another post); what I do deny is that the radical difference between mortals and God meanders down some “chain of being” in ways that can render any calls for earthly justice hypocritical. I hold, to the contrary, that relationships between God and mortals are metaphysically different from relationships between rulers and subjects (much less between magistrates and citizens), and because the relationship between the powerful and the weak should be one of brotherhood rather than of semi-divine magnanimity, I think that “justice” (Latin ius and Greek dikaiosyne and Hebrew mishphat, for those keeping score at home) becomes something other than justice when it’s limited only to the enforcement of contracts, tempered on occasion by the generosity of the powerful. Certainly the Old Testament prophets were not merely calling for contract-enforcement when Isaiah condemned those who despoil widows by adding field to field and when Amos called out the predatory lenders in Samaria (and their wives, who grazed like cows on the “fields” of wealth taken from the poor). I don’t think that any of the prophets entertained even for a moment that Israel’s sins of idol-worship would be mitigated by generosity (so put your “works-righteousness” gun away, cowboy), but because the rich and the poor are very much alike, and because the rich and God are very much unlike, the calls for divine mercy and the calls for earthly justice could come from the same mouth/pen/oracle without much of a thought that mercy and contract-enforcement were somehow contradictory poles that must be synthesized. They were simply parts of a whole, and that whole was called mishphat, justice. None of this lets the social-justice advocates off the hook, of course. As I noted earlier in the post, far too often any old cause of the New Left gets baptized in the name of being not-fundamentalist, and far too little inspection and criticism happens, especially when libertarian/capitalist categories of “choice” and “rights” rather than Christian practices like hospitality and thankfulness govern Christian discourse about “issues.” And certainly my own politics, the incorrigible Athenian democrat and Roman republican that I am, deserve scrutiny. My point here is that the philosophical assumptions we bring to words like “salvation” and “justice” render them anything but self-evident. In other words, this long and rambling meditation is going to end with a call for more, not less, theology. The bottom line? For now (until someone teaches me better), I’m going to say that what Zaccheus demonstrates in Luke 19 is not some wild antithesis to justice but the character of justice itself, returning to those defrauded what they’d lost. I’m going to say that the forgiveness of sin that the Psalmist thanks God for in Psalm 37 is also justice itself, though of the analogical, divine-to-human sort. And of course I’m going to say that Isaiah is no hypocrite when he calls on the people of Jerusalem to stop kidding themselves into thinking that their burnt offerings are going to satisfy a God whose call to the people is to treat one another justly, not just enforce contracts. In other words, rather than setting up “justice” and “mercy” as dialectical poles in opposition to one another, I’d rather call both contract-enforcement and the overarching concern for the good of the least of these what the Bible calls them, simply justice. May our own lives call into harmony what the world would put asunder. I don’t think that the account of Aslan’s sacrifice is Anselmian at all. Instead it recalls the virtue of ancient hero’s who were willing to make sacrifices for the polis. The Witch claims that she can sacrifice Edmund because he is a traitor. This could be read as a claim about justice, it could also be read that Edmund is ontologically of her party because he is treacherous. Regardless of which way one reads this Aslan is not satisfying the Deep Magic, that is the Witch’s mistake, but through heroic self sacrifice transforming, or better yet revealing, the nature of the Deep Magic itself. In other words the virtues of justice and mercy cannot be regarded as wholly separate, virtues are ultimately joined and cannot be opposed to one another. As far as I know the idea the narrow characterization of justice = the enforcement of contracts (assumed to be voluntarily entered into) between atomized “rational” individuals is almost entirely an American phenomenon, so that even most of the secular jurisprudence of the remainder of humanity regards justice as irreducible. It’s the “of her party” part of your account of the witch that makes me want to maintain the Anselmian character of Lewis’s atonement tale. In other words, if his treachery had bound him to be her servant, that’s one thing, but what results is not inherent ontological deterioration (a la Eustace thinking dragonish thoughts) but execution. I suppose I’m reading that linkage of crime and punishment as having to do with the fact that he betrayed a king and two queens. With regards to the transformation of the Deep Magic, I don’t see that as being anti-Anselmian; after all, Christ’s free entry into the crucifixion seems to be precisely where Anselm locates atonement. With regards to jurisprudence, do you see a corresponding dichotomy between “justice” and “mercy” also being particular to American Protestantism or just to American legal practice? I understood your reading of Anslem as God demands death for sin, only the death of a God will do, therefore Jesus, the only on in the Trinity who could die had to undergo death to satisfy God’s requirement for death. I understand Lewis as saying in the Lion, the Witch and the Wardrobe; in order for the polis (Narnia) to prosper, she requires the prophesied kings and queens. They aren’t yet crowned and the betrayal by Edmund’s betrayal is of his brother and sisters who have a call on his loyalty regardless of whether they are royalty. Aslan, like an ancient virtuous hero such as Horatio, willing to sacrifice his life for the polis. If Edmund is allowed to live then he will be able to rule as a king. Aslan’s heroic sacrifice thus saves the polis. Edmund only becomes fit to rule, he is transformed from being a traitor to being someone who can be a good king, by the heroic sacrifice. His character changes as a result. In other words he is not just “legally” no longer guilty, he is transformed, into the kind of person who can be king of the polis. Aslan’s heroic virtue is rewarded by resurrection, like an ancient hero being granted immortality (Hercules for instance). The narrative thus works both psychologically, the only thing which can enable Edmund to stop thinking of himself is that another is willing to sacrifice himself to save him, and classically; a virtuous hero saves the polis and achieves immortality as a consequence. Of course it is possible to read it down as a purely forensic account, but then its possible to read the Gospel accounts of the Crucifixion down in the same way, and as you know, a lot of people do that. do you see a corresponding dichotomy between “justice” and “mercy” also being particular to American Protestantism or just to American legal practice? It is certainly a feature of both, but if liberalism is indeed a Protestant heresy then that is unsurprising. American legal theory escaped the state-centric positivism that afflicted Europe, only to fall prey to a liberalism which disguises its positivism through the myth of autonomous individuals rationally entering into agreements. By liberalism I refer to the idea that autonomous individuals create all legal obligations by entering into agreements, including the fiction of a contract of society. This fiction is at least partially derived from covenant theology, and Northern Ireland and South Africa should stand as sufficient warning for the sickness of covenant theology.